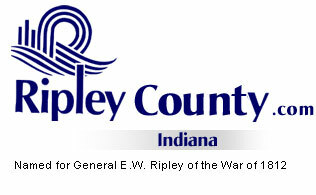 The Ripley County Council met on Tuesday, September 13th, 2005 at the Ripley County Annex in Versailles, Indiana. Don Dunbar, Council President called the meeting to order promptly at 7:00 PM with the pledge allegiance to the flag. Council Members Dephane Smith, David Simon, Mark Busching, Ben Peetz, Edward Armbrecht & Donald Dunbar were in attendance. Council Member Dramann was not in attendance. Council Member Armbrecht made the motion to approve the minutes of the August 16th, 30th & 31st, 2005 meetings seconded by Council Member Simon. Motion approved unanimously. Council Member Armbrecht made a motion to approve the additional appropriation for Ginger Bradford, Clerk Circuit Court of $8,000, from the Clerk’s Perpetuation Fund # 282-43500-000-282 seconded by Council Member Busching. Motion approved unanimously. Council Member Busching made a motion to approve the additional appropriation for Bill Davison, Sheriff of Ripley County of $48,000, from County General Fund # 100-37900-000-014 seconded by Council Member Simon. Motion approved unanimously. Council Member Smith made a motion to approve the additional appropriation for Robert Reiners, Commissioner of $40,000, from Highway (Gas, Oil & Lubes) Fund # 201-28900-000-027 seconded by Council Member Simon. Motion approved unanimously. Council Member Busching made a motion to approve the additional appropriation for Judy Schebler, Ripley County Communications of $2,500, from RSRF Radio Transmitters, Fund # 514-48555-000-514 seconded by Council Member Peetz. Motion approved unanimously. Council Member Smith made a motion to approve the additional appropriation for Patricia A. Thomas, Ripley County Health Department of $1,000, from Master Settlement/Environmental Health Fund # 331-29571-000-331 & $1,000 from Master Settlement/Advertising Fund #331-32901-000-331 seconded by Council Member Armbrecht. Motion approved unanimously. Council Member Simon made a motion to approve a transfer for Tad Brinson, Ripley County Area Planning of $500, from Consultant Fund # 100-37200-000-015 to Office Supplies Fund # 100-25300-000-015 seconded by Council Member Smith. Motion approved unanimously. Pam Sanders, Ripley County Economic Development Corporation presented an invitation to the Council Members to attend a workshop in Indianapolis on Thursday, September 22nd, 2005. Sanders advised that the Economic Development Corporation would cover the cost for the Commissioners and the Council. Pam Sander, Ripley County Economic Development Corporation & Brian Ahaus, Project Manager requested that the Ripley County Council give a 10 year Real Property & Personal Property Tax Abatement on behalf of Thomas Ertel. Sanders advised the council that the location of this project is in the County’s jurisdiction not the City Of Batesville. Neil Comer, Ripley County Attorney advised Ms. Sanders and Mr. Ahaus that they need additional paper work and should probably have an attorney help with the paper work and come back to the meeting in October. Bob Brewington, Board Director, Soil & Water had questions on the $5,000 Grant and was advised by the Ripley County Council that no salary raises were given for 2006 and that is why it was transferred from salary to a line item in the soil & water budget. Council Member Smith made a motion to approve the 2006 Salary Ordinances seconded by Council Member Busching. Motion approved by five (5) members Dunbar, Simon, Smith, Busching & Peetz. One (1) Council Member voted against (Armbrecht). Council Member Dramann was not present. Upon motion by Council Member Smith, seconded by Council Member Simon , the following was adopted by Five (5) Council Members (Dunbar, Smith, Simon, Peetz and Busching) and one (1) voted against (Armbrecht). Economic Development –Edward Armbrecht-Meeting Tomorrow Night. SEI Regional Planning Committee – Dephane Smith – Not able to attend the meeting. Grant Committee-Donald Dunbar – Kelly Vollet- has a grant for this round. EMS Advisory Committee – Dephane Smith –Meeting is Next Wednesday. Council Member Busching made a motion to adjourn until the next regular meeting on Tuesday, October 18th, 2005 @ 7:00 PM seconded by Council Member Armbrecht. Motion approved unanimously.